If you have ever been to Spain, you have probably been captivated by the diversity of its culture. It`s a big country with a fantastic heritage, friendly people and a great climate. A trip around coastal Spain will just reinforce this impression. Si usted ha estado jamás en España, es probable que le ha encantado la diversidad de su cultura. Es un país grande con un patrimonio fantástico, una gente amable y una clima estúpenda. In the northwest, picturesque landscape stretches all along the unspoilt coast from Galicia in the far west through the Asturias, Cantabria and the Basque country to San Sebastian. The countryside and mountains are luscious green reflecting the generous rainfall levels. The Picos mountains are an impressive range of challenging but rewarding hills for serious walkers. Cuisine in this area of Spain is probably best described as no-nonsense, nutritious and delicious with few frills. En el noroeste, un paisaje pintoresco se estira todo a lo largo de la costa no contaminada de Galicia en el oeste extremo entre las Asturias, Cantabria y el país vasco hasta San Sebastian. El campo y las montañas son muy verdes debido a los niveles de lluvía abundantes. Los Picos son una cadena de montañas impresionantes que constituyen un desafío gratificante para los excursionistas. La cocina en esta parte de España es probablemente mejor descrita como sin tontería, nutritiva y sabrosa con pocos adornos. On the north east, in Catalonia, there is an altogether different aspect of Spain. The warmer weather definitely seems to influence the temperament of the populace. 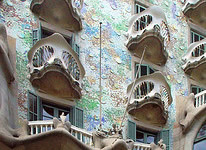 In the country`s second capital, Barcelona, there is an architectural elegance worthy of a major international destination. It seems somehow more cosmopolitan than its western neighbours. In the Placa Catalunya you can hear most European and North American tongues. 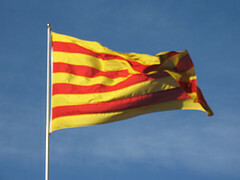 Catalan is the official language of Barcelona, of which the inhabitants are very proud. 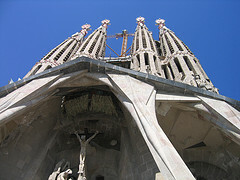 Nevertheless, there is no need to worry as most Catalans speak Spanish and a lot of them English as well. The appreciation of a warm and inspiring city attracts everyone. A walk down the famous Ramblas is a treat not to miss. The more serious tourist will just have to visit the variety of Gaudí landmarks, but as there are so many, we advise you not to walk, take the underground or the tourist bus. In this area, you don`t need to miss out on the tourist resorts. 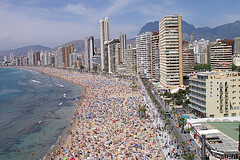 If your preference is for an English influence, a short way down the coast, you can join in the raucous fun of Salou. La Pineda next door has more of a reserved and Spanish influence. 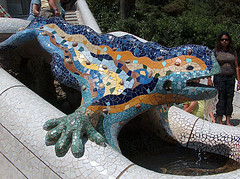 It caters for the Spanish tourists, so is more authentic in its offerings. To see a blog detailing the recent activities of the Costa Dorada, click here. En el nordeste, en Cataluña, hay un aspecto completamente distinto de España. El tiempo más caliente parece influenciar el temperamento de los habitantes. En la segunda capital del país, Barcelona, hay una elegancia arquitectónica digna de un grande destino internacional. Parece ser, por una u otra razón, más cosmopólita que su vecinos catalanes occidentales. En la Plaza Cataluña se puede oír la gente utilizando muchos idiomas europeos y estadounidenses. El catalán es la lengua oficial de Barcelona, de que los habitantes son muy orgullosos. Sin embargo, no se debe preocupar porque la mayoría de los catalanes hablan castellano y muchos hablan inglés también. El agradecimiento de una ciudad simpática y inspiradora atrae a todos. Un paseo a lo largo de las Ramblas famosas es un placer que no se debe perder. 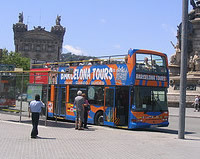 El turista más serio tiene que visitar las obras de Gaudí, pero como hay tantas, le aconsejamos no intentar a caminar para verlas; mejor tomar el metro o el autobús turístico. En esta región, no se necesita perder de los centros turísticos. Si se prefiere una influencia inglesa, con un trayecto corto bajo la costa, usted puede participar en la diversión estentórea de Salou. Su vecina, La Pineda, tiene una influencia más reservada y española. Los turistas españoles van allí, así es más auténtico en cuanto a lo que ofrece. Para ver un blog que detalla las actividades recientes de la Costa Dorada, pinchar aquí. Further down the coast, the Valencia influence becomes strong. Whilst overshadowed massively in the tourism stakes by its northern neighbour Barcelona, the historical town of Valencia is of more interest to those seeking culture and tradition than the modernist architectural brilliance that Barcelona provides. The presence of the local language `Valencian` (very similar to Catalan) is evident, as are some of the city`s quirky traditions. The famous fiestas `Las Fallas` and `La Tomatina`, which occur in and around Valencia, are not to be missed; whereas the `Tribunal de les Aigues`, which occurs every week outside the cathedral, still manages to attract hordes of tourists. Whilst the heritage of Valencia remains clear for everyone to see through its architecture, the city has adapted to the times to become an economic leader. With more locals than tourists, the city still has an area replete with bars and beautiful beaches. A city which combines history and modernity, Valencia is great for the tourists who want to avoid the cliché of being a tourist and discover history for themselves. Siguiendo por la costa, la influencia valenciana se hace más fuerte. Aunque eclipsada enormemente en términos de turismo por su vecino en el norte, Barcelona, la ciudad histórica de Valencia es de más interés a los que buscan la cultura y el patrimonio en vez de la brillantez arquitectónica proporcionada por las modernistas de Barcelona. La presencia del idioma local `valenciana` (muy parecido al catalán) es evidente, como lo son unas de sus tradiciones estrafalarias. No se debe perder las fiestas famosas de `Las Fallas` y `La Tomatina`, que se desarollan en o alrededor de Valencia; además, el `Tribunal de las Aguas`, que ocurre cada semana al exterior de la catedral, consigue todavía a atraer una multitud de turistas. Aunque el patrimonio de Valencia queda claro cuando se ve la arquítectura, la ciudad ha adaptado a la época actual haciéndose un líder económico. Con más habitantes de la zona que turistas, la ciudad tiene todavía un barrio repleto de bares y playas hermosas. Una ciudad que mezcla la historia y la modernidad, Valencia es la mejor para los turistas que quieren evitar el tópico de ser turista y en vez, quieren descubrir la historia por sí mismos. The Costa Blanca is quite a rugged coastline with some amazing scenery and easily accessible hills. For the keen walker this can be a very satisfying area. In the north of the region, Denia is a really attractive town with a host of things to see. The port is a mix of thriving fishing, commercial and leisure activities, with a superb modern marina. Dominating the town is the ancient castle which overlooks the entire area. The evenings are tranquil and quiet with most people enjoying the good selection of restaurants around the port and in the town. La Costa Blanca es una costa bastante escarpada con paisaje extraordinario y acceso fácil a las montañas. Puede ser una región muy satisfactoria para los excursionistas. En el norte de la región, Denia es un pueblo muy atractivo con una multitud de cosas a ver. El puerto es una meczla del pesquero próspero, actividades de comercio y de ocio, con una fantástica marina moderna. Dominando el pueblo es el castillo antiguo que tiene vistas a toda la región. Las noches son tranquilas y calmas con la mayoría de la gente disfrutando la buena selección de restaurantes alrededor del puerto y en el pueblo. 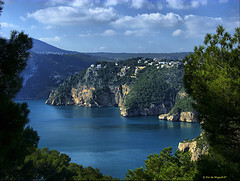 A little south of Denia is the family resort of Javea, ideal for a quiet holiday on a good beach and with no rowdiness. 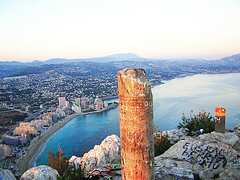 If you are travelling by car, further south down the N332 or the A7 you reach the popular resort of Calpe. Famous for its spectacular rock of Ifach which towers over 1000 feet above the sea, Calpe provides a little of everything for holiday makers. It offers a mix of the old and the new. 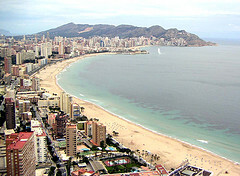 Blessed with wonderfully clean, sandy beaches, you can really relax and enjoy that special Costa Blanca climate. However when you are ready for exploring, the old town provides the traces of a rich Valencian culture and history linking all the way back to Roman times. This is balanced by the full range of modern facilities for a booming tourist industry. These include a new marina where you can partake in all manner of water sports and even take boat trips to Benidorm. 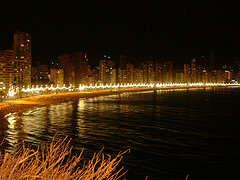 If it`s a bustling town you crave, look no further than Benidorm. In recent times this characterful town has had an undeserved bad press. However, it has two of the great beaches of Europe. Yes, maybe some of the British tourists don`t add to the ambience of the place, but this should be only a minor irritation. The old town is largely unspoilt by the invading tourists and boasts the excellent Casa Aragonesa tapas bar. 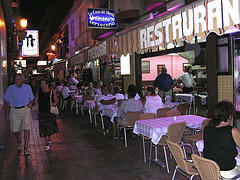 Don`t be self-conscious with your faltering Spanish: ask the counter servers for a good selection of the tapas on offer. Also ensure you wash it down with their excellent and unbelievably cheap Cava, in those funny champagne Perry glasses. Un poco al sur de Denia es el centro turístico de Javea, ideal para las vacaciones tranquilas en una playa bonita y sin gamberrismo. Siguiendo el camino en coche al sur de la N332 o la A7 se llega al centro turístico popular de Calpe. 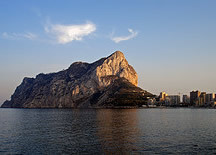 Famoso por su roca espectácular el Peñon de Ifach que domina de 300 metros arriba del mar, Calpe proporciona un poco de todo a los turistas. Ofrece una meczla del viejo y de lo nuevo. Dichoso con playas de arena maravillosamente limpias, se puede descansar de verdad y disfrutar de la clima especial de la Costa Blanca. 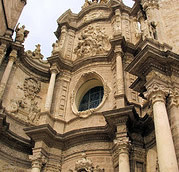 Sin embargo, cuando usted está listo a explorar, la ciudad vieja muestra los rastros de una cultura rica y historia valenciana que con origenes en las épocas romanas. Se equilibra esta historia con una gama completa de instalaciones modernas que aseguran una industría de turismo que está en auge. Éstas incluyen una marina nueva donde se puede participar en muchos deportes acuáticos y también hacer excursiones en barco a Benidorm. Si se prefiere un pueblo animado, no se tiene que ver más lejos que Benidorm. En los últimos años este pueblo de cáracter ha tenido mala prensa. No obstante, tiene dos de las mejores playas de Europa. Es verdad que quizás algunos turistas britanicos no mejoran el ambiente del sitio, pero ésto sólo debe ser una irritación secundaria. La ciudad vieja es en gran parte no afectada por los turistas invasores y se jacta del bar excelente de tapas, `Casa Aragonesa`. No se preocupe de su español titubeante: pedir a los dependientes una selección grande de las tapas en oferta. También asegure de tomar su excelente y increíblemente barata Cava, oferta en esos vasos extraños de champán, `Perry`. 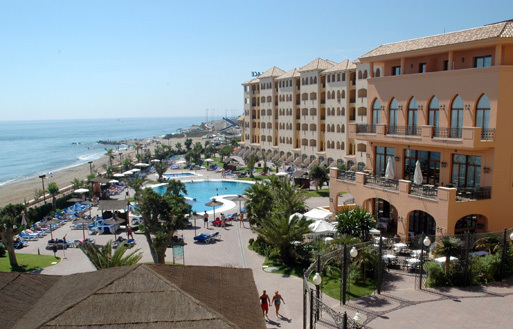 The Costa del Sol has a variety of resorts to suit all tastes. 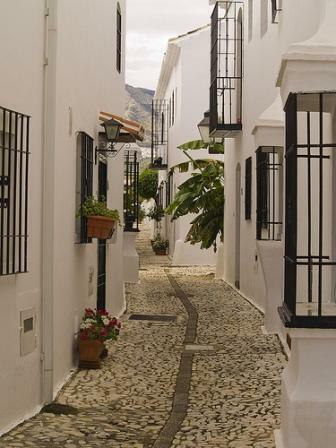 In the north, Nerja is understandably a popular resort and is home to a large British ex-pat community. 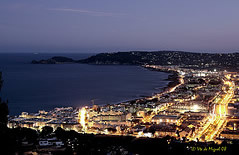 It is a relatively quiet town with a good selection of restaurants, hotels and apartments. The beach adjacent to the Capistrano complex is a good size and sheltered. An added benefit is the not-to-be-missed Ayo`s paella restaurant. This eatery serves up excellent paella to large numbers of appreciative locals and tourists alike. Don`t miss it. Es un pueblo bastante tranquilo con una buena selección de restaurantes, hoteles y apartamentos. La playa al lado del complejo Capistrano es bastante grande y abrigada. Un beneficio adicional es el restaurante de paella `Ayo`. Este restaurante sirve paella excelente a mucha gente apreciativa de la zona y igualmente a los turistas. No se lo pierda. 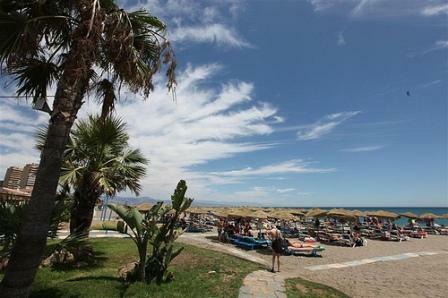 More life can be found in Torremolinos, but with a price of increased rowdiness. Again you can find whatever takes your fancy in this large town. Un-apologetically geared towards your average British tourist, there is plenty to occupy the kids. Take a trip to the nearby Benalmadena Costa to savour a little gem. A small coastal development, you can take a little motorised train around the small marina to view its pretty aspect. For dinner, there is a great selection of modest restaurants with picturesque views of the sea. Se puede encontrar más animación en Torremolinos, pero más bullicio también. Otra vez se puede encontrar todo lo que quiera en este pueblo grande. Sin disculpas está dirigido a los turistas británicos típicos y hay mucho para ocupar a los niños. Haga una excursión a la cercana Costa de Benalmadena para ver una joya pequeña. Una pequeña urbanización costera, se puede tomar un tren pequeño para dar una vuelta de la marina para ver su aspecto bonito. A la hora de cenar, hay una selección grande de restaurantes modestos con vistas pintorescas del mar. 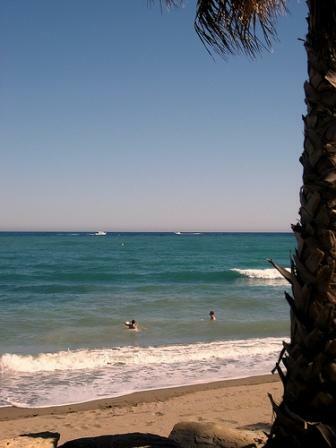 Further south you meet the mixed resort of Fuengirola. The town itself is typically Spanish with a good selection of shops and cafés/restaurants for everyone. There is also excellent and convenient under-ground parking in Plaza de la Constitución (Constitution Square), which is just up the road from the main concentration of tourist restaurants on Calle Moncayo. During evenings this area is full of life and great fun. However some of the seafront really has seen better days, and would guess that there must be plans to smarten it up. There is a shabby feel about stretches of the promenade, such as it is. It does improve as you walk south and the beach becomes more generous. Don`t miss the house of glass restaurant on the seafront it`s such great value. You can easily find it – just look for where all the locals are having their Sunday lunch! Visit the Sur in English website for great local news of the area in English ( and Spanish ). Más en el sur se encuentra el centro turístico mezclado de Fuengirola. El pueblo sí mismo es típicamente español con una buena selección de tiendas, cafeterías y restaurantes para todos. Hay también un aparcamiento subterráneo muy conveniente en la Plaza de la Constitución, que está cerca de la mayoría de los restaurantes turísticos en la calle Moncayo. Por la noche este barrio está muy animado y divertido. Sin embargo, el paseo marítimo tiene un aspecto usado y se supone que existan planos para desarollarlo dentro de poco. Es verdad que mejora un poco cuando se caminar al sur y la playa se hace más grande también. No se pierda el restaurante de cristal en el paseo marítimo porque se puede comer bien allí para poco dinero. Se puede encontrarlo facilmente - se debe simplemente buscar el lugar donde todos los vecinos almuerzan el domingo. Visitar la página 'Sur en inglés' para noticias locales de la región en inglés (y en español). 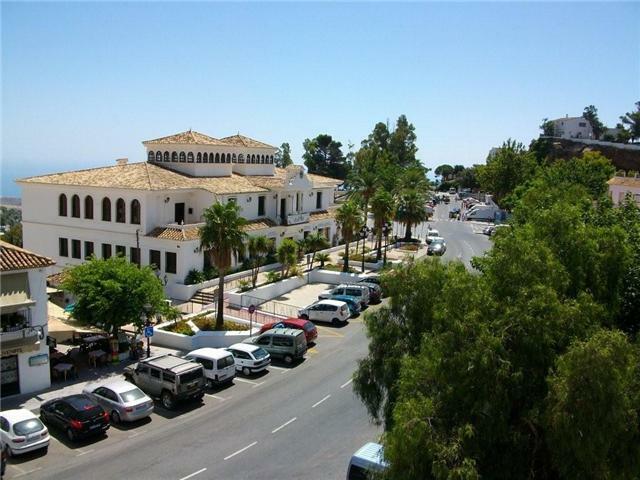 Before you leave the area, take a short diversion inland to the pretty hilltop village of Mijas. 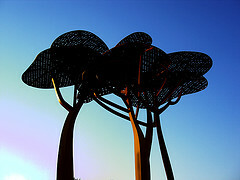 It is situated about 10 kms inland and the centre is full of interesting shops and restaurants. 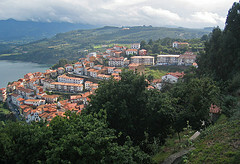 If you would rather use the town as a base for the Costa, why not rent an apartment. There are many with stunning views over to the sea. Try lunch in one of the popular cafes before heading back to the coast. Antes de salir de la región, haga una desviación para ir al interior del país al pueblo bonito de Mijas en la cima. Está situado aproximadamente 6 millas al interior y el centro tiene muchas tiendas y restaurantes interesantes. Si se preferiría utilizar el pueblo como una base para ir a la costa, por qué no alquilar un apartamento. Hay muchos apartamentos con vistas espectaculares del mar. Almorzar en una de las cafeterías populares antes de volver a la costa. As you take the dual carriageway road out of Fuengirola, look for the old castle and then the modern Hotel Beatriz, both on the left as you leave the town. 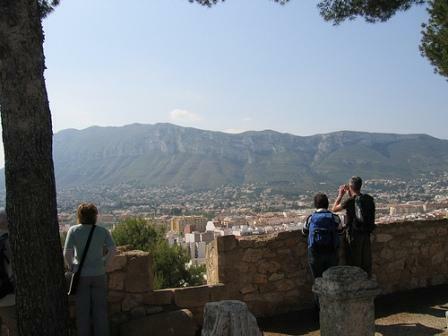 If you have time to stop, climb to the highest part of the castle and enjoy the panorama of the town. If you have longer time to stop, spend a night or two at the Beatriz - it`s a superb hotel. The rooms are enormous and all have views directly over the sea - watch the sun rise from the sea while enjoying that extra special cup of coffee. Mientrás que se sale de Fuengirola por la carretera, notar el castillo antiguo y entonces el hotel moderno 'Hotel Beatriz', ambos a la izquierda. Si se tiene unos minutos para parar, subir el castillo y disfrutar de la vista del pueblo. Si se dispone de más tiempo, quedarse una o dos noches en el Hotel Beatriz - es un hotel estupendo. Las habitaciones son enormes y todas tienen vistas del mar. Se puede mirar la subida del sol por encima del mar, mientrás que se disfruta de una taza de café especial. The next stretch of motorway down to Marbella passes through one of the greatest developments of new housing, apartments, villas and holiday homes in Europe. The search for the sun stops here for thousands of lucky people. If you are thinking of getting your own share of the continual sunshine and warmth of the Costa del Sol this is where to start. La próxima parte de la autopista a Marbella pasa por uno de los mejores desarrollos de nuevas casas, apartamentos, villas y casas de verano en Europa. La búsqueda del sol tiene su culminación aquí para mucha gente con suerte. Si se quiere tener su propia parte del sol y del calor continuo de la Costa del Sol, se debe empezar aquí. Si se conduce por la calle mayor en Marbella se puede sentir la elegancia del pueblo. La calidad de las tiendas aquí esta altá y está claro que están acostumbradas a servir a compradores ricos. Si se prefiere un sitio menos ocupado, reanudar el camino hasta Puerto Banus, al oeste del pueblo. Hay una pequeña marina muy elegante con yates por los que se morirá y a veces algún famoso. Ir de compras al Corte Inglés - su mostrador de pescado está increíble.